Bright, warm sunflowers cluster together on a rich, deep field of forest green. Sunflowers show up often in the landscape of the Sun card or being held by the Queen of Wands. 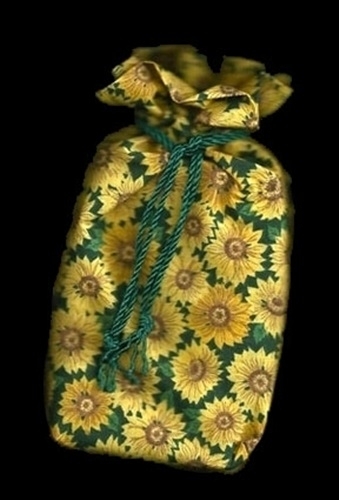 This sunflower covered Tarot bag will provide an environment of radiant energy to the Tarot cards that live within! Sunflower Symbolism: Sunflowers are heliotropic, which means they slowly move throughout the day to always face the sun. Not surprisingly, it is strongly associated with the Sun, warmth, and all that brings with it: happiness, abundance, plenty, authority. Sunflowers are native to the Americas, and were cultivated by many Native People as an important food crop. They were also used by Medicine People for various magical purposes, and were carried into battle by warriors as symbols of courage. In the 16th century sunflowers entered the European world. Because it is forever seeking the light, the sunflower became a symbol of religious devotion and happiness. In China, they are symbols of vitality and longevity, and are said to bring good fortune.